Snowy weekend up at Tunkwa, but no wind and temps stayed quite mild. 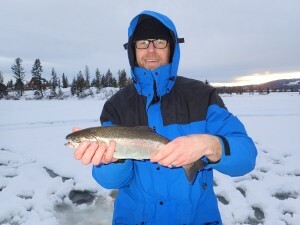 Mixed fishing reports came in from our guests, Saturday morning was absolutely dead, with only a few trout being landed, but it picked up in the afternoon, as the weather stabilized, but you had to be in the right spots. Fishing shallow 5-7′ of water, off the weeds was key. 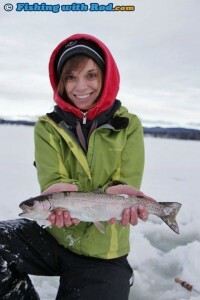 Some better reports coming in on Sunday, with one of our regulars landing a beautiful rainbow that was almost 23″ long. The weather has cleared right up, with sunny, clear ‘bluebird’ skies, it’s just beautiful up here! Nights are dropping down to about -7. The ‘Fishing with Rod’ and GoFishBC gang are here for a few days this week, to make an ice fishing video and some other promo work for GoFishBC. They got out for a short bit yesterday afternoon, and got into a couple fish, missed some to. Kitty landed the first one, using a pink jig head tipped with a piece of mealworm. 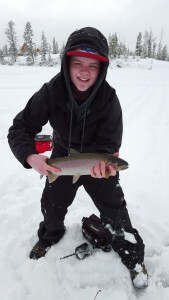 Steve and Natham tried there hand at ice fishing Tunkwa last weekend, and were rewarded with some nice Rainbows!